We left Napa at 7:30 am, on our way to visit the dimension stone quarries from here to Austin. It was 22 degrees but the truck was warm, and we had a sack full of sandwiches and a smart phone full of audible books. In the bed of the truck was an orderly display of Watershed Blocks, selected to show the range of colors and textures attainable from sourced aggregates. The Central Valley was brown for this time of year, but the low angle of the winter sun and the frost in the air softened the folds in the western hills in a way I’d never quite appreciated. All these mountains were scrunched up when the Farallon Plate barged in from the Pacific. Leaving the interstate at Bakersfield, we headed east over the Tehachapi Pass, into the Mojave Desert. Snow was on the mountains and a Union Pacific train had derailed at the top of the icy ridge, scattering flat cars stacked two-high with forty-foot containers. 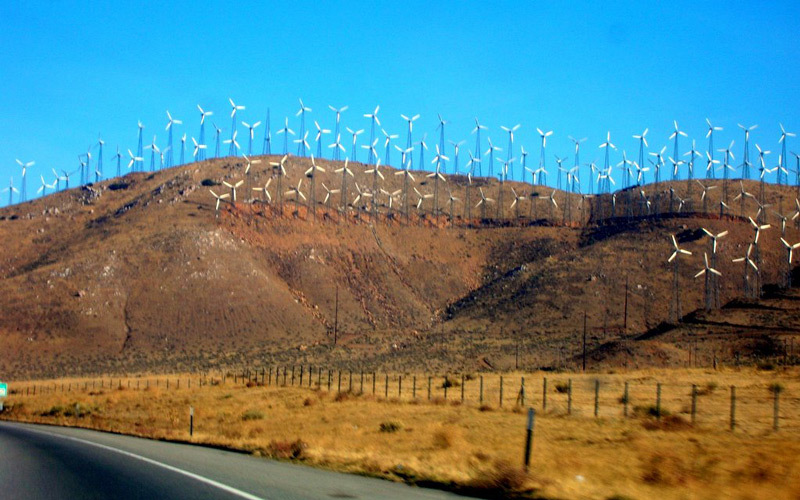 Highway 58 beyond Tehachapi is a rock-lover’s paradise. The strata are unbelievable. I kept remembering John McPhee’s description of a rug pushed up against a wall. Hikers really like the Mojave, and tourism is the area’s economic focus. That and military bases. But what we saw was the economic power of the wind. The Alta Wind Energy Center is the largest wind power plant in the world - 9000 acres of turbines producing three times as much electricity as any other wind farm in the country. The other industry in the Mojave is cement production. 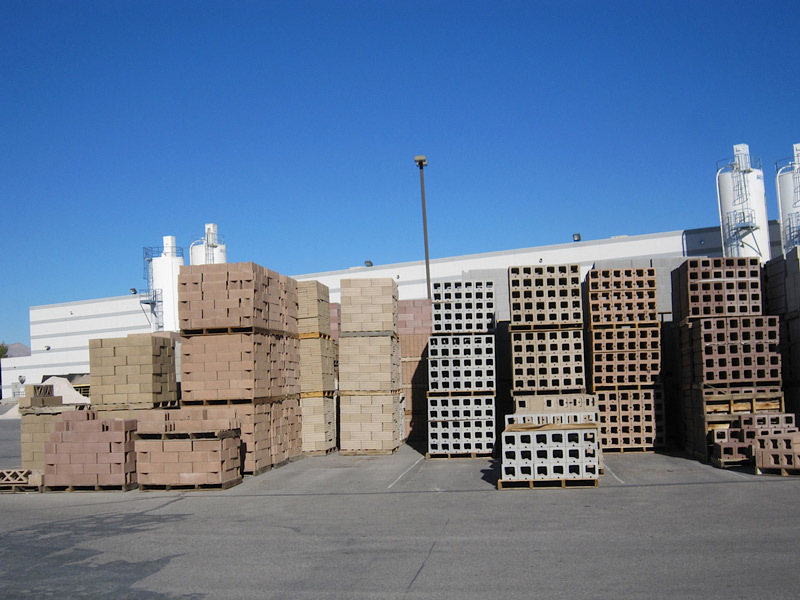 CalPorland, Cemex, and Mitsubishi all have plants located on top of the limestone between Victorville and Las Vegas. Limestone in the desert? I had to check my geology. Yes indeed, “during the Paleozoic era the Mojave Desert was covered by shallow seas, as evidenced by fossil marine creatures in limestone and dolomite” (source). We met up with Interstate 15 at Barstow, then headed northeast towards Las Vegas, with the sun behind us lighting up the strata like a movie set, and the right lane chock-a-block with eighteen-wheelers transporting what America lives on from one side of the continent to the other. Once we crossed the state line, we were grateful to see that Zappos was keeping the highway clean for us. You can see the lights of Las Vegas from 25 miles away. I checked. We pulled into the self-park at the Hard Rock Hotel ($40 per night), ate the best sushi ever at Nobu, and were out of there by 8:00 the next morning. 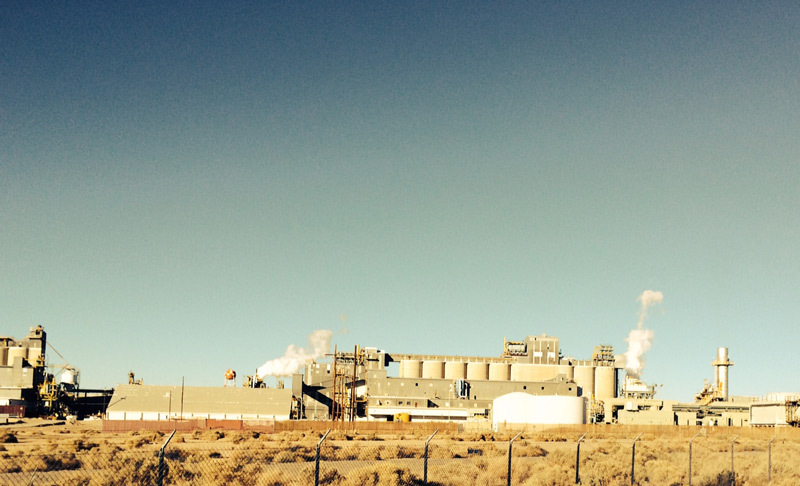 Our first real stop on the “rock and block” tour was the Cind-R-Lite block plant in north Las Vegas. Mark Diamond toured us around. Cind-R-Lite was originally located on top of a cinder cone they own in the Armagosa Valley, 95 miles north of Las Vegas. Now they truck the cinders to the new plant, built about ten years ago. They run two six-at-a-time Bessers and can produce 20,000 units per day, running both lines, all with only six employees. The plant was clean, well-organized, and had a glassed-in control room. Outside were the bins and silos feeding directly to the two mixers with the delivery conveyors running through the walls above the block machines. The plant itself was made of Cind-R-Lite blocks. We wrapped up our visit leaning on the bed of the truck, looking at the Watershed Block display and talking about the opportunities for a “green block”. Mark admitted he doesn’t get much call for them, although he is aware that on some projects, specifically schools and government jobs, blocks with an improved environmental profile are required. Currently when they need to make a concession towards green they add 6% recycled content. They don’t use fly ash because it would mean they’d need another silo. When I talked about our slow, one-at-a-time press, Mark told me about an old Fleming one at a time they had out back and how he wanted to paint it and bring it out in front of the showroom. I told him once we solved our manufacturing problems he could put one of our “Green Machines” next to his Bessers. That got us all laughing. Back on I-15 east. The sun was again behind us lighting up the strata and the Basin and Range. How in the world did those people with the covered wagons make this trip? They made maybe 15, 20 miles per day. I can see that far.